By directing energy beams at tiny crystals found in a Martian meteorite, a Western University-led team of geologists has proved that the most common group of meteorites from Mars is almost 4 billion years younger than many scientists had believed - resolving a long-standing puzzle in Martian science and painting a much clearer picture of the Red Planet's evolution that can now be compared to that of habitable Earth. In a paper published today in the journal Nature, lead author Desmond Moser, an Earth Sciences professor from Western's Faculty of Science, Kim Tait, Curator, Mineralogy, Royal Ontario Museum, and a team of Canadian, U.S., and British collaborators show that a representative meteorite from the Royal Ontario Museum (ROM)'s growing Martian meteorite collection, started as a 200 million-year-old lava flow on Mars, and contains an ancient chemical signature indicating a hidden layer deep beneath the surface that is almost as old as the solar system. The team, composed of scientists from ROM, the University of Wyoming, UCLA, and the University of Portsmouth, also discovered crystals that grew while the meteorite was launched from Mars towards Earth, allowing them to narrow down the timing to less than 20 million years ago while also identifying possible launch locations on the flanks of the supervolcanoes at the Martian equator. 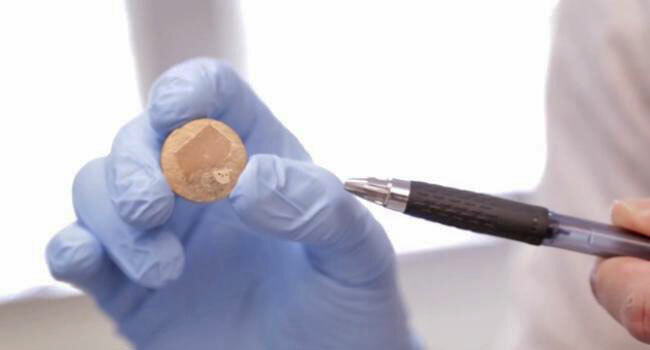 More details can be found in their paper titled, "Solving the Martian meteorite age conundrum using micro-baddeleyite and launch-generated zircon." Moser and his group at Western's Zircon & Accessory Phase Laboratory (ZAPLab), one of the few electron nanobeam dating facilities in the world, determined the growth history of crystals on a polished surface of the meteorite. The researchers combined a long-established dating method (measuring radioactive uranium/lead isotopes) with a recently developed gently-destructive, mineral grain-scale technique at UCLA that liberates atoms from the crystal surface using a focused beam of oxygen ions. Moser estimates that there are roughly 60 Mars rocks dislodged by meteorite impacts that are now on Earth and available for study, and that his group's approach can be used on these and a much wider range of heavenly bodies. "Basically, the inner solar system is our oyster. We have hundreds of meteorites that we can apply this technique to, including asteroids from beyond Mars to samples from the Moon," says Moser, who credits the generosity of the collectors that identify this material and make it available for public research. A University of Wyoming research professor has helped solve the question of how old Mars meteorites are and when volcanism actually occurred on the red planet. Kevin Chamberlain, a research professor in UW’s Department of Geology and Geophysics, used newly developed mineral-dating techniques he created to determine the age of volcanism on Mars at 200 million years ago, as well as the timing of a large-impact event 22 million years ago that launched rocks off the surface of Mars. is a co-author of a paper that appeared in Nature. that launched rocks off the surface of Mars. The rocks eventually fell to Earth as meteorites. Chamberlain is one of seven co-writers of a research paper, titled “Solving the Martian Meteorite Age Conundrum Using Micro-Baddeleyite and ‘Launch-Generated Zircon’,” that was published in today’s issue of Nature, an international weekly journal of science that publishes peer-reviewed research in all fields of science and technology. “The combination of techniques allowed us to determine the magmatic age of the lava on Mars as well as the time that the sample was launched into space by a bolide impact,” Chamberlain says. Chamberlain developed the new dating technique at UW with Norbert Swoboda-Colberg, a lab technician in the UW Department of Geology and Geophysics, and Susan Swapp, a senior research scientist, also in geology and geophysics. The dating technique required the use of a specialized instrument called a secondary ionization mass spectrometer or SIMS, of which only three exist in North America, Chamberlain says. The instrument analyzes a mineral sample by excavating microscopic pits (about 1 micron deep by 20 microns in diameter) in the rock sample and analyzing the isotopic compositions of the excavated material. For scale, the diameter of a human hair is roughly 100 microns, Chamberlain says. Using a SIMS instrument at UCLA, Chamberlain analyzed 18 different crystals of the minerals baddeleyite and zircon. All 18 were found within a 20-millimeter square (roughly three-fourths of an inch) region of a polished surface of the meteorite. Both minerals are major reservoirs for uranium in meteorites. The large crystals are each less than 15 microns in length, too small to separate physically from the rock. The new dating technique locates the grains using electron beam imaging instruments, and then analyzes them in-situ without needing to break the rock apart. Using the mass spectrometer, Chamberlain measured the ratio of lead to uranium, which allowed him to calculate the age of the meteorite grains. “We solve the (age) conundrum by determining the degree of shock-induced strain within the crystals, using in-situ electron nanobeam instruments at the University of Western Ontario,” he says. Chamberlain says both techniques are relatively non-destructive, which made their use ideal for meteorite samples. Outside of the excavated pit, the rest of the sample remained intact. The project was partially funded through a faculty research grant Chamberlain obtained from the Wyoming NASA Space Grant Consortium. Meteorite samples were loaned by the Royal Ontario Museum in Toronto. Scientists from UW, the University of Western Ontario, UCLA and the Royal Ontario Museum collaborated on the project. 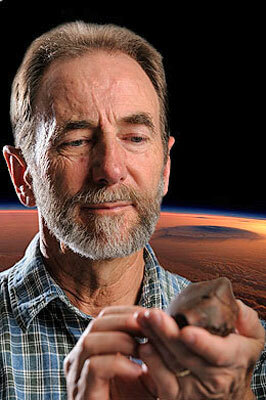 To date, 65 samples of Martian meteorites have been discovered on Earth. Many were found in either Antarctica or the Sahara Desert, Chamberlain says. In those two places, there are broad plains with no mountains above the ice or sand - which means that, if any rock is found on those surfaces, it had to come from space, Chamberlain explains. There are many different types of meteorites, but these 65 have bits of Martian atmosphere trapped within them, he says. “The 65 samples are basaltic compositions,” he says, noting it’s the same material found on the ocean floor or on the surface of the moon. However, the large volcano on Mars is basaltic in nature. Other researchers have speculated that many of the Martian meteorites were a result of a few large bolide impacts on a lava flow on the flanks of that volcano. The 200-million-year age of volcanism from these newest research findings challenges previous research methods that interpret the ages of ejected igneous crust from Mars to be as old as 4 billion years, which would mean that the planet’s volcano would have been extinct for a long time, Chamberlain says. “The eruption formed the lava. Rocks crystallized and formed during the volcanic eruption,” he says. Chamberlain says the timing of the large-impact event is between 22 million and 2 million years ago. Chamberlain presented results of the group’s research at an invited talk at the Goldschmidt 2012 International Geochemistry Conference in Montreal last summer, and at UW’s Department of Physics and Astronomy colloquium this past spring. “We plan to apply these techniques to additional meteorites from Mars, the moon and several asteroids to gain a better understanding of the evolution of the solar system,” he says.